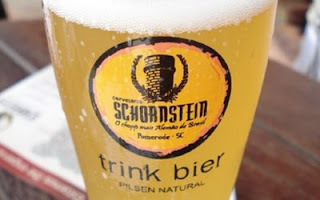 We just revisited Pomerode last weekend and decided to spend the night, rather than the usual day trip, so we could try the local brewery, Schornstein. It was a good idea: the beers at this microbrewery were great- my favourite being the Pale Ale, a strong flavoured beer that will please lovers of Real Ale! At the brewery, you can also snack in typical German fare such as sausages and hackepeter (the German version of middle-eastern Kibbe). If you want to have a proper meal of typical German Colonial cuisine, go to Wunderwald for lunch. The most famous dish is Marreco recheado (Stuffed roasted goose served with apple puree and red cabbage). For me, this is as good as German food gets! If you have any space left, visit the Torten Paradis Kaffehaus for tea and cakes in the afternoon. Next door is the equally tempting shop for the Nugali chocolates- the closest thing in Brazil to Lindt chocolates. To burn all these calories, rent a bike from the tourist office and cycle through town up to the Enxaimel route (the timber-framed houses built in early 20th Century by immigrants from Pomerland). Cycling is a very popular mean of transport here, with cycle lanes in all the main roads. 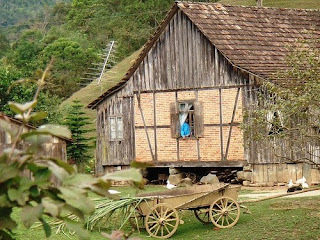 An interesting but sad cultural note: although German immigration to Santa Catarina preceded the Great Wars, the settlers suffered a great deal of hostility during this period and many had to change names and their way of life. A striking example is found near the end of the route. There is an old cemetery to the right of the road, where you will see the tombs of the original immigrants- all with eulogies in German, except for those that died during the Second World War, when German was completely banned in South Brazil. If you would like a guided visit to Pomerode, check our Deutsche Santa Catarina day trip from Florianopolis. Revisiting Serra Gaucha this week, we made a stop at Bento Gonçalves, a town founded by Italian immigrants in the middle of 19th Century. Bento is famous in Brazil for its wines and make a great destination for a couple of days away from Porto Alegre, the Capital of Rio Grande do Sul. A great surprise was to find the Sapore & Piacere café, a cafe/bistro that serves delicious lunches for less than US$ 10! Or if you pass Bento in the afternoon, try their cakes and coffee. The café is near the exit of town, just across the church. Another good gastronomic stop, besides visiting the Vale dos Vinhedos (wine valley) for some wine tasting (see our self-drive program - http://brazilecojourneys.com/destinations2.php?onde=RS) is at the Casa da Ovelha in the Caminho de Pedras, a rural road with well preserved old stone farm houses, to buy yogurt and cheese made of ewe’s milk. Their mature Pecorino is a great buy! Last week we participated in the Adventure Travel World Summit in Sao Paulo. The event was a great opportunity to make new contacts and meet fantastic people working in adventure and ecotourism throughout the world. We also had a unique chance of attending some amazing talks on sustainable tourism. In the opening night Gerard and Margie Moss gave a great introduction about Brazil and about their project studying the influence of the Amazon in the rainfall patterns throughout Brazil. Check http://www.riosvoadores.com.br/index.php for more information. Antonia Neubauer from Myths & Mountains gave a great talk about how to be a responsible tour operator in developing countries. Their READ project is truly a great example to follow. See www.readglobal.org for more information. The main theme of the Summit probably was that there is a growing desire for travelling as an instrument of personal transformation. The closing lecture by Carol Bellamy was for me the most inspiring. She pointed that responsible travellers should not only look at transforming themselves but also transforming the lives of those they meet. I couldn´t agree more.